Every May is National Preservation Month. This post is updated and expanded annually, to encourage us to celebrate the month. 1. Become a member of your citywide (or countywide or regional) preservation organization, such as the DC Preservation League, the Municipal Arts Society in New York City, Baltimore Preservation, Historic Districts Council in New York City, Cleveland Restoration Society, Preservation Resource Center of New Orleans, Landmark Society of Western New York (which serves Rochester, among other places), etc. 2. Join a neighborhood preservation group (such as Capitol Hill Restoration Society, Historic Takoma, or Historic Mount Pleasant). 3. Join the National Trust for Historic Preservation while you're at it. If you join, you can visit NT owned sites and affiliate organization museums at a discount/free, get discounts at Historic Hotels, and discounts on products you purchase. 4. Volunteer/1. Get involved in a preservation issue in your neighborhood or the city at large, which could include attending meetings of your local historic district/preservation commission, which in DC is the Historic Preservation Review Board. As one example, in the Takoma DC/Takoma Park neighborhood in DC, one of the neighborhood preservation issues is trying to get control of the Takoma Theatre, and reopening it as an arts facility. The owner is recalcitrant and wants to either sell it for more than it is worth as a theater, or to tear it down and build apartments-condominiums, but of course, today's real estate market doesn't make the latter choice economic, not to mention, not possible because the building, fortunately, is a protected resource in the DC Inventory of Historic Sites. 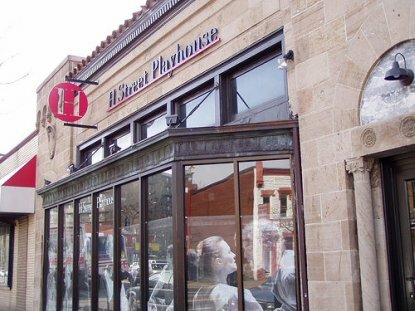 Join the Takoma Theatre Conservancy and work with others to make the dream become reality. 5. Volunteer/2, a "division of the preservation movement" is the Main Street commercial district revitalization program, which links economic development with historic preservation focused on the revival of local commercial districts and downtowns in smaller communities. There are affiliates in every state, and in many provinces in Canada, and in other countries as well. In the DC region, Maryland and Virginia have state level programs--Baltimore's program at the city level is independent of the state program, and there are a number of Main Street programs in DC. The Main Street Approach is ground up, where residents and other stakeholders join in with merchants and property owners to work on improving the commercial district overall. Typically, programs have a manager and may have additional full-time or most likely, part-time staff. It's volunteer. In my experience, interestingly, volunteers in Main Street programs tend to be 10-15 years younger than those in traditional preservation organizations, and the most active Main Street volunteers tend to live closest to the commercial district. Big downtowns and business improvement districts tend to be members of the International Downtown Association, and are more focused on clean and safe activities and tend to be run by full-time staff, although in some cities such as San Diego, many of the business improvement districts are run using the Main Street Approach. or by joining a Main Street commercial district revitalization group in your neighborhood. 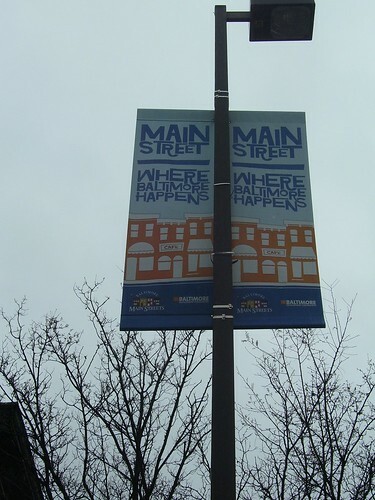 There are more than 1200 Main Street programs around the county, including active programs in every state. 6. See a movie or play at a historic theater. There aren't many historic cinemas in DC proper any more, but the Uptown Theater in Cleveland Park is one. I had a blast recently seeing a midnite film at the Byrd Theatre in the Carytown district in Richmond. For "legitimate" theaters you have many choices in the DC area such as the Warner, the National, the Studio Theatre, the Lincoln Theatre, the Shakespeare Theatre at the Landsburgh, the Atlas Performing Arts Center, the H Street Playhouse, and sort of kind of the Tivoli Theatre in Columbia Heights. 7. Shop at stores in commercial districts that are historically designated: i.e., Cleveland Park; Georgetown; Capitol Hill; Dupont Circle. Flickr photo by M.V. 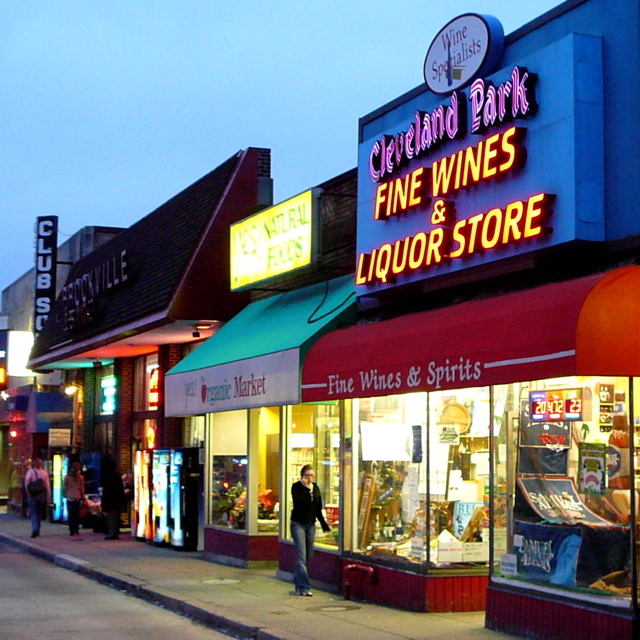 Jantzen, who writes, Cleveland Park has some of the best neighborhood-serving retail shops. 3423 Connecticut Ave NW, Washington, DC. 8. Eat in a restaurant in a historic building/historic district. 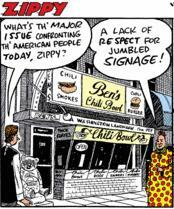 It's not that old, only 50 years, but Ben's Chili Bowl is one of the few remaining restaurants in the city that is truly old... Readers have suggested Martin's Tavern in Georgetown and Cafe Mozart, a German restaurant downtown. 9. Explore a place in the city that you don't know. 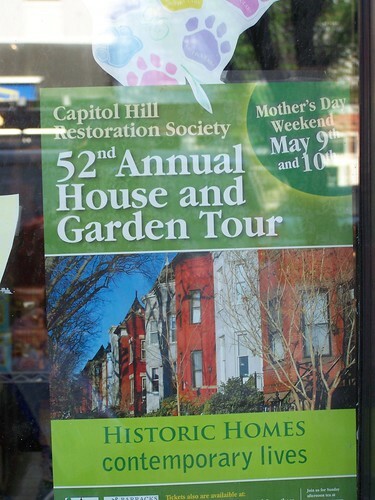 Go on a neighborhood tour, such as those sponsored by Cultural Tourism DC or neighborhood groups, a house tour, or building tour. Check out a talk (not all of them cost money) at the National Building Museum. Many groups sponsor house tours. Today's is the tour in Takoma. Next weekend, there is the house tour in Capitol Hill. There are others. 10. Shop at a historic public market. Eastern Market, the city's last remaining public food market building, built in 1873, will be reopening in July probably. 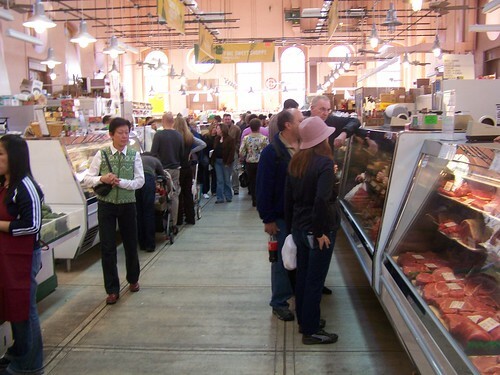 There is also the Florida Market district, not as fancy, or the Maine Avenue Seafood Market. 11. Check out the resources at the Washingtoniana Collection at the Martin Luther King Central Library, the Kiplinger Library at the Historical Society of Washington, the Jewish Historical Society. 13. Learn about historic preservation. The reason I am a strong supporter of preservation is that I have come to believe that hands down, it is the only approach to economically sustainable neighborhood and commercial district revitalization that works for the long haul. Probably the fastest way to get up to speed would be to read some of the work by Donovan Rypkema, such as his speeches, including "Culture, Historic Preservation and Economic Development in the 21st Century" and "Economic Power of Preservation," and his report on the economic value of preservation for New York, New York: Profiting through Preservation. Note also that these reports from the University of Florida Law School's Center for Government Responsibility are also excellent: Economic Impacts of Historic Preservation in Florida, Update 2010 (Research Report: Executive Summary; Technical Report) Contributions of Historic Preservation to Quality of Life in Florida (2006) (Executive Summary; Technical Report); A Florida Boon: Historic Preservation (Research Report: Executive Summary; Research Report: Technical). Hands down though, the best speech on the power and centrality of beauty and historic preservation in civic life is that by Mayor Joseph Riley of Charleston, SC. 14. Another way to learn a lot but very quickly is to attend a preservation conference such as the annual meeting of the National Trust for Historic Preservation (this year it's in Buffalo, New York starting October 19th), the National Main Street conference (in Des Moines, Iowa starting May 22nd), and when you visit other places, check out how they deal with historic preservation matters, and offer that learning to us when you come back. Preservation Maryland has a good conference. This year it's in Annapolis, Maryland, on May 19th and 20th. Many other areas have great preservation conferences but not in May, such as the state conference in Colorado, usually in February, and the conference of the Landmark Society of Western New York. 15. Read a historic district brochure (or more than one), available online or in hard copy at the Historic Preservation Office. I would also read your community's preservation plan, which should be available from the Planning Office. DC's Historic Preservation Element in the Comprehensive Plan is also important, if you live in DC. I am a big fan of the design guidelines publications, which also describe local historic districts, from Montgomery County Maryland and Richmond, Virginia. And the Philadelphia Rowhouse Manual is also quite good. As are the various architecture element and style guideline bulletins published by the Capitol Hill Restoration Society. 16. 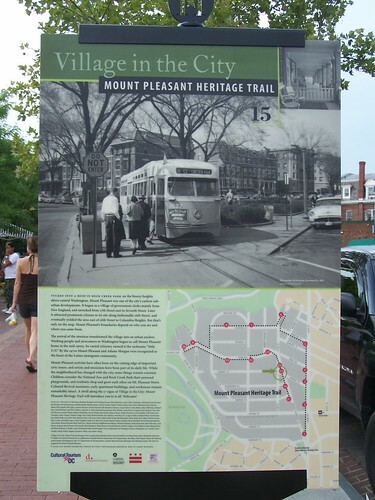 And follow the path of one of the many Heritage Trails "produced" by CulturalTourismDC in DC. But many communities have similar kinds of interpretation programs. Richmond has just introduced a trail on slavery, which obviously, given that this year is the 150th anniversary of the start of the Civil War, is particularly relevant and a good opportunity to reflect on our past. 17. Take a walk or bicycle ride along the C&O Canal. (And I suppose it's allowable to drive along a national, state, or local scenic byway.) Or a walk or ride on other historic trails, roads, railroads, and greeneways. 18. Visit a historic cemetery. In DC, we have the Congressional Cemetery or the Rock Creek Church Cemetery at St. Paul's Episcopal Church, among others. 19. Explore historic preservation matters in your region, beyond the borders of your community. In DC, go to the Bladensburg Waterfront Park in Bladensburg, Maryland and consider the time when this was a major port, when tobacco was king, and DC was still part of Prince George's County, Maryland. They offer river rides on the weekends, including a jaunt into DC to the National Arboretum. This year for example, the Historic Hyattsville (Maryland) house tour is Sunday May 15th. 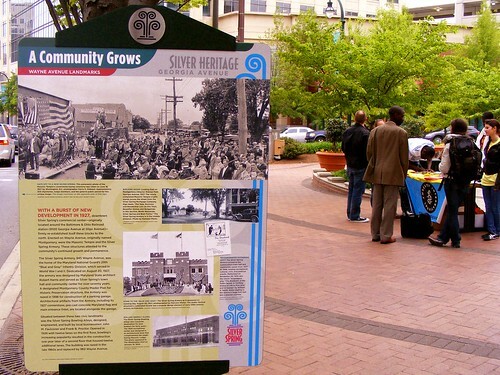 Silver Spring has launched a historic trail. It will be constructed over time, but a number of the markers are in place now, and the didactics on the signs are excellent. If you like Vietnamese food, one of the markers is just a couple doors down from a Vietnamese restaurant, across the street from the B&O Railroad Station, at the southeast corner of Georgia Avenue and Sligo Avenue. Flickr photo of the Wayne Avenue marker by thecourtyard. Prince George's County has an extensive inventory of historic sites that are open to the public, etc. 20. Check out an exhibit at the Anacostia Community Museum or the Historical Society of Washington or one of the other house museums and historic sites in the city and region. 22. Encourage your friends to stay at a historic hotel in the city or a bed and breakfast located in one of the city's historic districts. 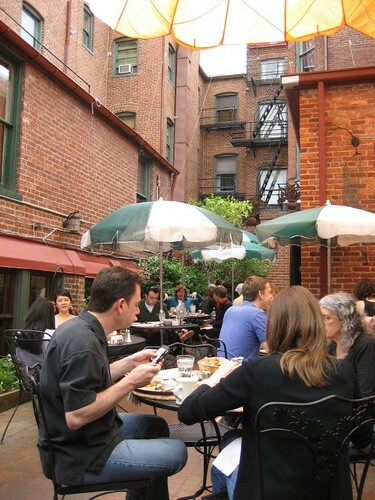 For example, the Tabard Inn in the Dupont Circle Historic District is one of the most romantic places in the city to have weekend brunch--out on the patio, during the spring, summer, and fall. Brunch at Tabard Inn, Flickr photo by lilpixiegirl03. 23. Walk on the grounds of one of the universities (CUA, Trinity, Georgetown, Howard, Gallaudet). E.g., Kendall Green at Gallaudet was designed by Frederick Law Olmsted. 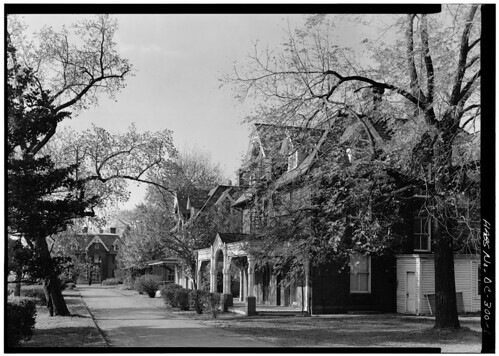 Historic photo (Library of Congress) of Kendall Green, Gallaudet University. 24. Visit Union Station. Designed by Daniel Burnham, it's an incredible example of the City Beautiful Movement. Check out chapters from Bill Wright's dissertation on Union Station. He's a great writer! 25. 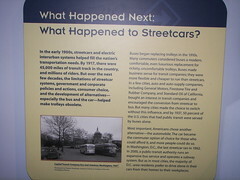 At the National Museum of American History, go see the exhibit on transportation history, "America on the Move." Part of it uses Washington as an example specifically. But in any case, it explains the role of transportation in urban and regional development, and will give you a lot of insight into these issues as they relate to the DC region. 26. Ride Amtrak, MARC, or VRE along rail lines in the region. And check out the B&O Railroad Museum (Baltimore), the Baltimore Streetcar Museum and the National Capital Trolley Museum (Montgomery County, Maryland). Don't forget National Trains Day on May 7th. There will be many events in major cities, including Washington, NYC, Chicago, Los Angeles, and Philadelphia. 27. Visit a national park. Many cities, including DC, which for obvious reasons, has many nationally owned parks, the system of Fort Circle Parks works to preserve the forts built during the Civil War to protect the city from Confederate invasion. Fort Stevens, hidden behind a church on Georgia Avenue, around Quackenbos Street NW, was attacked by Confederate forces, and President Lincoln was up there and watched. Up Georgia Avenue a bit, close to Walter Reed Hospital, is a somewhat forlorn and neglected battlefield cemetery and monument honoring soldiers who died at the battle at Fort Stevens. 28. Learn about the L'Enfant Plan and the McMillan Commission, so that you can understand the antecedents of the city, and make better land use decisions going forward, for your neighborhood and for the city. 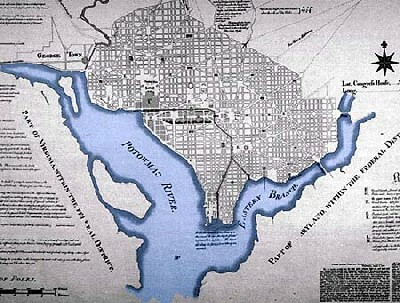 Start with Washington in Maps by Iris Miller and Washington: Through Two Centuries by Joseph Passonneau. 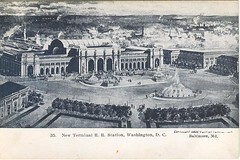 And see "Washington: Symbol and City," a permanent exhibit at the National Building Museum. 29. Visit the Lincoln Cottage on the grounds of the Armed Forces Retirement Home. 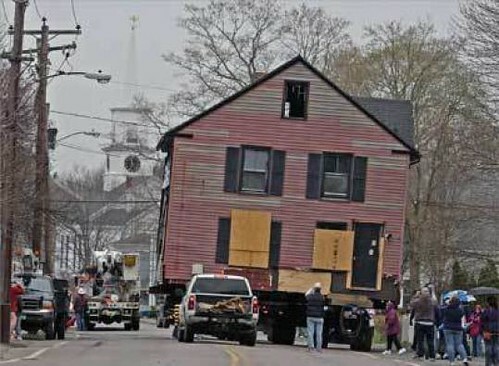 Or the Octagon House, or the Scottish Rite Temple on 16th Street, or ...? 30. The DC Public School system has an archives and museum that is also a meeting center, Sumner School, at 17th and M Streets NW. Free interpretive pontoon boat tours take place from April through October. 33. If you own "an old house," and want to learn more, I highly recommend subscribing to magazines such as Old House Journal, Old House Interiors, American Bungalow, This Old House, etc., for many reasons. You learn about historic architecture and details. They run features on interesting neighborhoods, places you can try to see when you travel. And the magazines offer good ideas of how to make historically appropriate changes in your own house. I had never been interested much in "the decorative arts" and interiors of houses all that much before, but having moved into a 1929 bungalow that was relatively intact, and including a 1930s Magic Chef Oven, I've become much more attuned and interested. This photo is from when we saw the house the first day. Obviously, you don't put lamps on your oven. 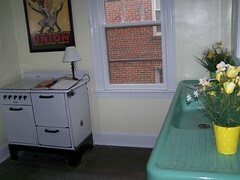 The image shows the oven to the left, and a side view of the double sideboard seamfoam green kitchen sink, which dates from the early 1920s. 34. What suggestions do you have?